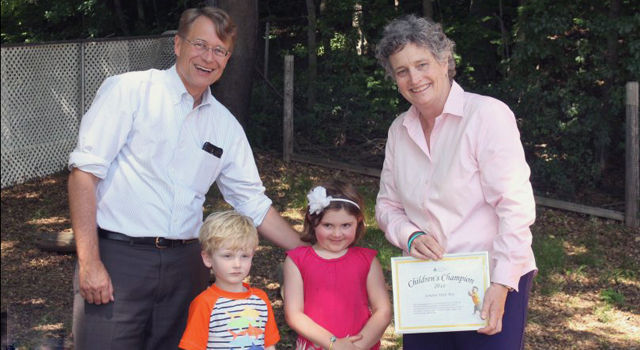 HARTFORD – State Senator Beth Bye and State Representative Andy Fleischmann, both of West Hartford, are among 12 legislators selected as 2018 “Children’s Champions” by the Connecticut Early Childhood Alliance. Bye and Fleischmann, who were among 12 legislators to be so honored, received their awards on June 26 at the School for Young Children in West Hartford. “Each of the legislators we’re recognizing this year stood up for children to protect funding for child care or to push policy change that supports families with children,” said Merrill Gay, executive director of the Alliance, in announcing the 2018 honorees. According to Gay, legislation passed this year includes: a bill that will make it easier for homeless families to obtain child care; a bill allowing the Connecticut Office of Early Childhood (OEC) to prioritize infants and toddlers in the event there exists a Care4Kids wait list; and an act mandating insurance coverage of essential health benefits including pregnancy and immunizations. In addition to Bye and Fleischmann, other legislators honored include: Rep. Cathy Abercrombie, Rep. Michelle Cook, Rep. Noreen Kokoruda, Rep. Gayle Schlossberg, Rep. Bobby Sanchez, Rep. Toni Walker, Sen. Toni Boucher, Sen. Paul Formica, Sen. Marilyn Moore, and Sen. Cathy Osten. The Connecticut Early Childhood Alliance is a statewide organization committed to improving outcomes in the areas of learning, health, safety and economic security, for children ages birth to eight.